Equipped with an LGA775 socket, the ASUS Maximum VI Formula motherboard supports quad-core processors. This means there’s room for much faster, smoother multitasking potential. This is because the tasks are divvied up between the cores. Along with improving multitasking capabilities, this also maximizes processing power and minimizes lag. The memory standard is DDR2 1200/1066. This may also be maxxed out with the full 8GB of space to improve processing speed even more. The improved BIOS is easy to flash right from the internet.The Maximus Formula has been designed around the Intel X38 Express chipset. This ASUS motherboard masterfully handles data flow, no matter what hardware and other devices you connect to it. Use it in conjunction with Intel CPUs from the Pentium D and Pentium Extreme Edition. 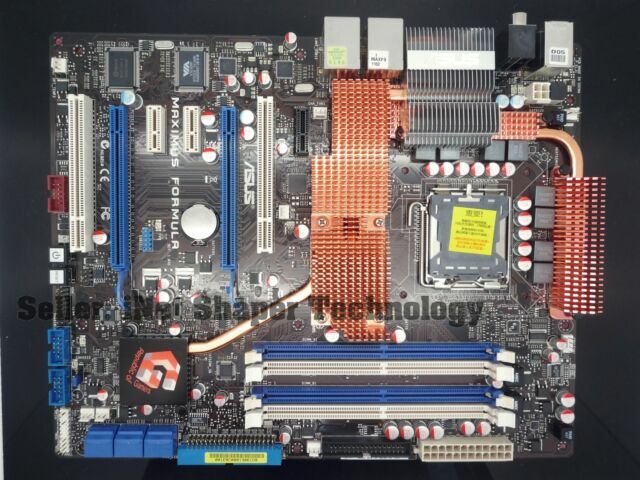 It is also compatible with Pentium 4, Core 2 Extreme, Core 2 Quad, or Core 2 Duo series.The Maximus Formula LGA775 Socket Motherboard provides great performance for 3D graphics and any other applications that demand space. Its Dual-Channel DDR2 technology also has a high speed of up to 800 MHz. This Maximus Formula Motherboard has a pin-fin thermal design that delivers optimal thermal performance. This ASUS Maximus Formulas product uses only high-quality polymer capacitors onboard for improved lifespan, durability, and enhanced thermal capacity. This product, as well as its packaging, comply with the European Union's Restriction on the use of hazardous substances.With its embedded 2-Phase DDR2, this product lets you obtain higher memory frequencies and experience better performance. It also ensures longer power component lifespans and higher overclock ability due to its cooler temperatures and efficiency. The COP EX feature increases chipset voltages without causing overheating. Its Voltiminder LED displays the voltage status for NB, CPU, SB, and Memory in a color-coded fashion. Its Loadline Calibration ensures stable and optimal CPU voltage under heavy loading conditions. With ASUS EPU, you digitally monitor and finely tune the CPU power supply with VR responses in heavy or light loadings.This product has SupremeFX, which delivers sound at a high definition to ROG gamers. It makes it easy for gamers to spot enemies in 3D gameplay. With this tool, you enhance human voices to make dialogues more audible. This feature also eliminates background noise when recording is in progress. The onboard eight-channel HD audio enables high-quality 192KHz/24-bit audio output. It also has a jack-sensing feature, retasking functions, and multi-streaming technology that simultaneously sends out different audio streams. This allows you to communicate with your gaming partners on the headphone while playing a multi-channel network game. Its IEEE 139a interface delivers a high-speed digital interface.The External LCD Poster posts critical POST information. When system malfunction occurs, the LCD poster automatically detects it and translate the errors on the LCD during POST. The onboard switch makes it easy to fine tune preferences without having to short the pins or move jumpers. Its Q-Connector lets you connect or disconnect chassis front panel cables in one easy step. This adapter eliminates the need to plug in one cable at a time. Asus finally got it right!! At Last, I have found an Asus motherboard that is user friendly and so far, trouble free. This is my 3rd Asus motherboard.The first 2 were and still are junk at best!! This one is runnig flawlessly thus far and it "looks cool" too. I bought this motherboard on ebay as a used product as I have older components (bought new a little over a year ago) and did not want to start all over again at a cost of over $1500.00 to just have a comparable system!! I could care less about "keeping up with the Jones"!! I just want a good system that allows me to do the things that I have always done with my computer! This motherboard (thus far) has stepped up to the plate!! Although I have many doubts about Asus being able to build a motherboard that lasts, so far I am happy with this one!! Nice board, if you can find it, but there's better out there. This is a cool board with lots of bells and whistles. This is an x38/ICH9R board that supports firwmare raid and ECC memory. This is probably the best hotstage board I've ever worked with: power and reset buttons are on the board, as well as a button on the I/O panel for clearing BIOS ram. Memory support is DDX2. I use 800MHz; I'm not sure if the board can take faster, but the chip set definitely can. These are becoming rare, but there's good news: a better ASUS board is still available: P5E3 deluxe, which can run with 1.333 DDX3 ECC memory (possibly the only board that can do that). I lost my previous Rampage formula so no surprises, clocks well, adjustable of voltages and parameters. Water cooled and high performance accessories like Sata3, USB3, Watercooled, can clock stable at 4.24 on a Q9650 Quad 3.0 CPU. X38 based board is nice for budget minded gaming build, Maximus Formula is nicely designed and use less expansive DDR2 memory rather than force to get new DDR3. The extreme sound card work beautifully. This board is well layout, put it in the Rosewill Wind Knight with Z5 CPU heat sink, it gives good performance without the noise. Also had OCZ ModXstream Pro power supply in the system. The BIOS menu provide load of options to tweak the system, still playing with the options so it's not done yet.